The Murder of Gregory Johnson Jr.
Background Info on the Death of Gregory Johnson, Jr.
Gregory stood at a height of 6-foot-2 and weighed 185 lbs. ; the distance between the basement floor and water pipe from which he was allegedly found hanging measured out to 5 feet, 10 inches. Denise was notified of her son’s death by Clearlake, CA police officers that showed up to her house. Denise claims she felt intimidated because one officer had his hand on his gun and kept asking if the family was going to drive down to San Jose that night. Fearing for their safety; the Johnsons did not leave Clearlake, CA until the next morning. When Denise Johnson arrived at the Sigma Chi fraternity house around 1:30pm on November 23, the basement smelled like Pine-Sol because somebody had already disinfected the crime scene. The Grand Master of the fraternity was also already at the house when the Johnson family arrived. The house was filled with fraternity boys who Denise Johnson believed were looking for a fight—Denise remembers seeing a police riot squad van parked at the house when they arrived. One of Gregory’s fraternity brothers lied to the evidence collector and tampered with Gregory’s belongings. Members of the fraternity told the evidence collector a cell phone at the site did not belong to Gregory, so it was left behind. Gregory’s sister-in-law recognized the phone and frat members acknowledged that the phone belonged to Gregory, before handing it over to the family. The Santa Clara County coroner’s office refused to let the Johnson family view/ID Gregory’s body; they stated that the fraternity brother who found Gregory dead had already ID’d his body. The coroner’s office told Mrs. Johnson that she needed to raise a few thousand dollars ASAP to have Gregory’s body sent to Clearlake, CA, or else they would cremate his body. When Gregory’s body finally arrived at the funeral home nearly two weeks after his death, Denise Johnson discovered a 6-inch crack in the back of his head, from which brain matter was still oozing. This injury was not mentioned in the incomplete autopsy report that the Johnsons received. Gregory’s neck was also broken. SJPD Officer Dokes was also at the Sigma Chi fraternity house when police responded to a call about Gregory’s suicide. SJPD has denied that any SJ officers were at the scene, but former independent police auditor Ladoris Cordell has provided documents proving that Officer Dokes and other SJPD officers were present. Officer Dokes was also involved in the Feb 2015 fatal shooting of Phillip Watkins, an unarmed African-American male who was shot in the back by police officers who were responding to a 911 call for a mental health crisis. The Johnson family filed a lawsuit pro-per in Feb 2015, hoping the courts would force SJSUPD and the coroner’s office to release all documents from the investigation to the Johnson family; this lawsuit was thrown out due to statute of limitations. The Johnson family believes SJSU covered up Gregory’s death because his fraternity included boys from wealthy and influential families. Gregory was close friends with a fraternity member whose father was the CEO of Monster Energy Drinks. According to Mrs. Johnson, Gregory’s friend deleted all pictures of him ad Gregory after Gregory’s death. They had recently gone on a vacation with a group of friends—his pictures from this vacation were deleted. The Johnson family is willing to have Gregory Johnson Jr.’s body exhumed to have an independent autopsy conducted. An independent autopsy proving that Gregory did not die by strangulation from suicide would force authorities to re-open the investigation. Rev. Denise Johnson, Gregory Johnson Sr. and their family still actively search for answers concerning the death of their son, Gregory Johnson Jr., in the basement of Sigma Chi Fraternity House on the San Jose State University campus on Nov. 22, 2008. University officials concluded Gregory’s death was caused by ligature hanging and call the death a suicide, but an FBI investigator worked for months and told Denise that the police report she had received was not complete. FBI investigator Alex Kozant advised Denise to file a Freedom of Information Act request to obtain the complete police report. However, the officials in Washington, D.C., who looked at the investigation did not want to proceed with the case, according to what Kozant told Denise. The Johnsons are still raising money to exhume Gregory’s body from Lower Lake Cemetery for an independent pathologist to do a second autopsy. Pictures of a jagged scar on the back of Gregory’s scull that indicate a blunt force injury and the fact that a paramedic pronounced Gregory dead rather than taking him to the hospital are just some of the revelations Denise and Gregory Johnson Sr. are questioning. “Why does the police report state that paramedics kept checking Gregory’s pulse?” asks Denise. The Johnson family took many picture of Gregory’s body when it arrived to the mortuary for burial, and these pictures do not show scars on his neck that would have been evident from a ligature hanging. Denise is working with Assemblyman Sandre Swanson and lawyers in the Bay Area to find justice and resolve her son’s death. Bay Area writer Joan Moss can be reached at joanmoss@att.net. Her earlier, comprehensive story on the death of Gregory Johnson Jr. is online at http://www.sfbayview.com/2009/investigation-continues-into-suspicious-death-of-black-sophomore-in-san-jose-state-frat-house/. However, the death of former San Jose State student Gregory Johnson, Jr. and his mother’s efforts to obtain justice paint a very different picture. A few months ago Denise Johnson, mother of the victim, approached a member of San Jose Justice for Trayvon Martin, now known as Colectivo Justicia San Jose, with disturbing details surrounding the alleged murder of her son. There was a party at the fraternity, the night before he was reported dead. Gregory’s body had no markings on his neck to suggest strangulation, which is odd considering reports stated he had been hanging for nearly 2 hours before his body was discovered. Gregory stood at a height of 6-foot-2 and weighed 185 pounds; the distance between the basement floor and water pipe from which he was allegedly found hanging measured out to 5 feet, 10 inches. Gregory’s mother was not notified of his death until several hours had already passed: grief counselors and university administration were notified of her son’s death before she ever received a call, and thirty days passed before her son’s body was returned home. The Santa Clara County Coroner did not allow her to view the body during that period. When Denise Johnson arrived at the fraternity house around 1:30 in the afternoon, it smelled like Pine-Sol because somebody had already disinfected the basement. His fraternity brother lied to the evidence collector and tampered with Gregory’s belongings: members of the fraternity told the evidence collector a cell phone at the site did not belong to Gregory, so it was left behind. Denise Johnson’s daughter-in-law recognized Gregory’s phone, and the fraternity members acknowledged that it belonged to Gregory before handing it over to the family. When Denise’s daughter-in-law went through the phone later that night, she found that all of Gregory’s pictures had been deleted and somebody had attempted to call his voicemail at 8:30 pm on November 22, nearly 6 hours after his estimated time of death. When Gregory’s body finally arrived at the funeral home, Denise Johnson took some pictures, after discovering a 6 inch crack in the back of his head, from which brain matter still oozed. His neck was also broken. The FBI took over the case, investigating it as a possible hate crime. To address the recent hate-crime incident, the university stated it would conduct an independent and transparent investigation. Additionally, fact finder “Mike” D. Moye completed a 405-page report, summarizing the events that took place and efforts that were employed to address any issues . This is all in response to on-campus demonstrations in which students joined the university’s Black Student Union for a series of “Black Lives Matter” rallies. If the university truly believes that Black lives matter, it has a duty to acknowledge Denise Johnson’s claims, reopen Gregory Johnson, Jr.’s case, and conduct an independent and transparent investigation. Denise Johnson deserves to know the truth about her son–she, too, deserves a detailed report outlining the investigation of her son’s death. Until the university begins to take the safety and lives of its Black students’ seriously, horrific events like these will only continue to pop up on our television screens. From the university’s failure to notify Denise Johnson and Gregory Johnson Sr. of their son’s death immediately upon discovery, to the lack of bruises suggesting strangulation – but appearance of a head injury suggesting foul play – the university clearly failed to handle Gregory Johnson’s death appropriately. Gregory’s death was not further investigated; the FBI took over the investigation, exploring it as a possible hate crime, but that investigation ended in Washington DC at the desk of House Republican Eric Holder, without any explanation. This is the same Eric Holder who “did not prosecute IRS employees over allegations the agency improperly handled the applications for nonprofit status by conservative political groups; and misled Congress over whether he was aware of a search warrant issued for the emails of FOX News reporter James Rosen.” The university, as well as the U.S. government, has a duty to properly re-investigate the death of Gregory Johnson, Jr., and file charges against any person found to have been involved in his death. Additionally, the university must play a crucial role in ensuring that the students who have been charged with the most recent hate-crime are not only removed from the university, but also charged with felonies denoting that their hate-crimes violated civil rights. As a well-respected university in the heart of San Jose, California–one of the most diverse metropolitan areas in the nation–it is the university’s duty to make it clear that racism has no place in our community. A grieving mother, Rev. Johnson, is counting on me to tell you about her son, Gregory Johnson, Jr. Greg was a junior at San Jose University when his life was cut short. He was the only black person living at the Sigma Chi frat house. Gregory was a strong, handsome young minister – 20 years of age, 6’2″ tall, weighing around 200 pounds. His job at Bally Total Fitness was ideal for Gregory, who planned to go into sports medicine. The night Gregory died in his frat house, his family was not informed for seven hours, and they were not allowed to identify his body. Rev. Johnson did not see her son’s body for 14 days, when she had his remains sent home for the funeral and burial. Authorities said “suicide,” but how can a 6 foot, 2 inch tall man of superior strength hang himself from a six-foot basement ceiling? Why did Gregory’s fraternity housemates move his body before police arrived? What happened to the extension cord Gregory supposedly used for self-murder? Why did Gregory’s Caucasian girlfriend refuse to speak with Rev. Johnson about Gregory and his death? WHY WERE THERE NO MARKS ON GREGORY’S NECK WHATSOEVER ALTHOUGH HIS HEAD WAS PRACTICALLY SEVERED FROM HIS BODY AT THE BACKBONE? Why did his eyeballs not protrude if he really hung? Why was there a six-inch gash in the back of Gregory’s head with his brains oozing out? I have delayed beginning work on Rev. Johnson’s story, because it is so like my own brother’s covered-up murder by police (see “Wrongful Death of Larry Neal.com). Wealthy people and police officers are allowed to commit crimes against working class people, especially African Americans, and authorities routinely cover-up such such crimes if survivors have limited resources to fight for open disclosure and justice. Sigma Chi is a fraternity that has some wealthy and famous alumni. 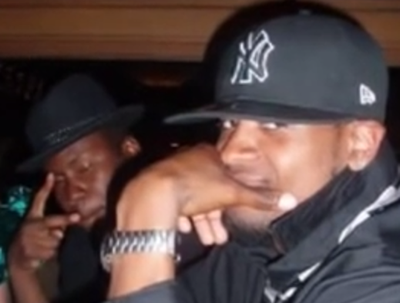 A couple months after President Obama was elected, Gregory, the only African American living in that San Jose frat house, supposedly committed suicide under remarkable circumstances: He allegedly hang himself in a basement that was shorter than Gregory, unexplained head trauma, no neck wounds, no extension cord, no inquest, and authorities refused to give Gregory’s family the results of any investigation. A pathologist who Rev. Johnson hired told her that Gregory’s death was not a suicide. He was too timid to put his findings into writing although he kept Rev. Johnson’s fee. There is no justice and no peace for Gregory’s family. There was a time when justice quests could be squashed by telling police not to investigate and instructing mainstream media not to publish news about certain murders like Gregory Johnson’s and the secret arrest and wrongful death of Larry Neal, which is discussed at this URL http://WrongfulDeathOfLarryNeal.com . But with the advent of the Internet, average Americans are able to publish our own victimization. William Windsor, a congressional candidate from the State of Georgia, was himself a victim of judicial corruption. He began to expose corruption in the judicial system by writing and talking online about his denial of justice. Thousands of people read Bill’s articles on the “Lawless America” website at this URL http://lawlessamerica.com and tuned in to communicate with Bill during his TalkShoe.com conference calls. Bill is a businessman and a trained paralegal who is a superb justice advocate. That is why many people started to call Bill and email him from all over the country and share their own experiences. After I published this article, Lawless America was taken offline at Facebook. It stayed offline all night until around 10:30 a.m. on September 24. When Lawless America reappeared at Facebook, the Sigma Chi photo was added back to the site. We assume the photo also reappeared on the people’s walls where Denise shared it, but that has not been verified. I find it particularly disturbing to have discovered, by happenstance, the story about a handsome, young, 6 foot 2, black San Jose State University student who was found hung. Gregory Marcel Johnson, Jr. was found hanging in the basement of his frat house on November 22, 2008. His death has been ruled a suicide. Here is were my ire set in: it was stated that Johnson was found hanging from a pipe in the basement and his “knees were bent, legs resting on the floor underneath him”. Suicide? Really?? Furthermore, no note was found and his parents stated they were not allowed to view his body to identify him, but were told by authorities that he was identified by his drivers license. I just happen to know a student of San Jose State and she stated the atmosphere there is thick. Words like “cover up” and “racism” have risen like a thermostat on a sweltering hot day. My questions are many. Like why hasn’t this story gained more attention? Why didn’t they let his parents see him? How could someone hang themselves while standing on the floor? But more importantly, why is it still so easy to kill a black man in America and bury the story?????? Has anyone heard anything else about the case of the police officer who shot that black man in the back in Oakland? Another buried story. But let there be a white female in distress (Levy, Holloway, Benet) and we will be reminded of their deaths until WE die. Ever heard of MWWS???? It stands for Missing White Woman Syndrome. A concept that states more attention is paid to the demise of attractive, white woman than other races or classes. Ergo, Gregory Marcel Johnson, Jr.
Do not misjudge me, the wretched death of anyone regardless of their stats is wrong. But our history of killing “colored folk” in this nation is egregious. I’m going to call a spade a spade on this one people. This “suicide” smells a whole lot like a lynching. SAN JOSE — The California State University system and Sigma Chi Fraternity asked a judge on Wednesday to dismiss a civil rights lawsuit filed by parents of an African-American student who was found hanging inside a fraternity house at San Jose State in 2008. The parents believe their son, Gregory Johnson Jr., did not commit suicide but was the victim of a hate crime on the San Jose campus. The state and the fraternity say the case should be shuttered because it has exceeded the three-year statute of limitation. But the parents, Gregory Johnson Sr. and his wife Denise, say the limitation should be set aside because they have spent years fruitlessly trying to get proof, answers and documents from the school, the fraternity, San Jose State police and even the FBI. U.S. Magistrate Judge Nathanael Cousins listened to attorneys on both sides make their arguments at the federal courthouse in San Jose, where the case was filed Feb. 18. The complaint is part of a string of challenges by the Johnson family, and it is the first known complaint filed in federal court. The school and the fraternity say student Johnson, 20, committed suicide by hanging. The parents believe their son — the only black member of the campus chapter of the national fraternity — was brutalized first and then made to appear as if he took his own life. Two of the SJSUPD officers, Santos and Van Der Hoek, were also named in the recent federal lawsuit Laurie Valdez filed against SJSU and SJSUPD for the death of Antonio Guzman Lopez on February 21, 2014. Valdez filed the lawsuit on behalf of her and Antonio’s 5 year-old son, Josiah Lopez, who is also the face of the Justice for Josiah campaign. According to police reports, Officer Dote–one of the officers who responded to the emergency call about Gregory Johnson, Jr.’s death, was also involved in the most recent San Jose shooting on Wednesday, February 11, in which SJPD killed 25-year-old Phillip Watkins after he placed a 911 call for help, due to psychological distress. San Jose State University has a history of so-called suicides among Black men, but many of these cases involve suspicious circumstances. In Gregory’s case, there were no ligature marks on his neck, but reports claim Gregory hung himself. A dead body doesn’t bruise, meaning that if Gregory was actually found hanging–as reported–somebody hung him after he was already deceased. Reports also fail to mention the crack in the back of his skull that was still leaking brain matter when Gregory’s body finally arrived at the morgue in Clearlake, CA. Can you possibly give me some articles stating Officer Dote was called to the scene for Gregory Johnson, Jr.’s death? I’ve tried finding some, but can’t come up with anything. Any information would be greatly appreciated. Thank you. San Jose University has a problem. African American men are terrorized and killed there. But we are not allowed to discuss Lakim Washington (1997), Katrell Collier (2006), Gregory Johnson (2008), unnamed 17-yr-old (2013). The latest victim died on February 9, 2014. Brenden Tiggs, 18, was a freshman studying kinesiology. The coroner ruled his death a suicide. “Denise Johnson and Gregory Johnson Sr. are claiming negligent infliction of emotional distress and civil rights abuses in their complaint filed at the federal court building in San Francisco. In addition to the $520 million in damages, the family is demanding a trial by jury. The body of 20-year-old kinesiology major Gregory Johnson Jr. was found in the basement of the Sigma Chi Fraternity house on Nov. 22, 2008 by fellow fraternity member Michael Laris. The Santa Clara County medical examiner’s autopsy report states the cause of death as a ligature hanging. Facebook Justice for Gregory Johnson Jr. The Bloody Sands Of Sigma Chi: Who Killed Gregory Johnson Jr? Why Is Former San Jose State University Student Gregory Johnson, Jr.’s Death Still An Unsolved Mystery? 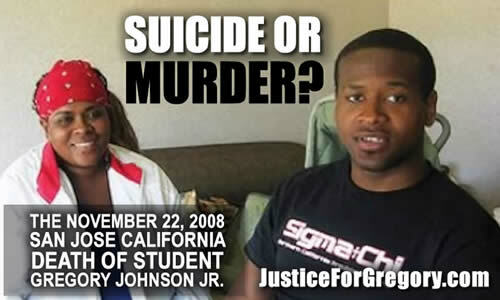 Murder at the Sigma Chi House at San Jose State University: Death of Gregory Johnson, Jr.
W.E. A.L.L. B.E. Radio: Strangefruit @ San Jose State: The Hanging Of Gregory Johnson, Jr.
What Does Las Vegas News Personality Shannon Moore Know About The Hanging of Gregory Johnson, Jr.?